An annual lecture series, named in honor of Minister Emeritus Ernie Pipes, which presents speakers on social justice and other topics of interest to our congregation. The Ernie Pipes Lecture Committee is thrilled to bring you another fabulous weekend this year. We are excited to announce that our minister emerita, the Rev. 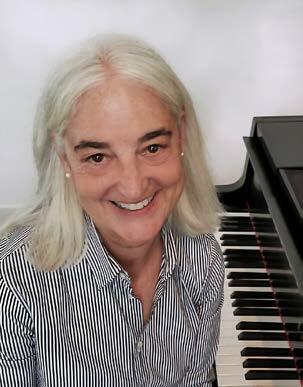 Judith Meyer, has agreed to come for a Saturday afternoon tea on Nov. 4, and the Pipes Lecture on Sunday, Nov. 5 at 2:30 pm in the sanctuary. The title of Rev. 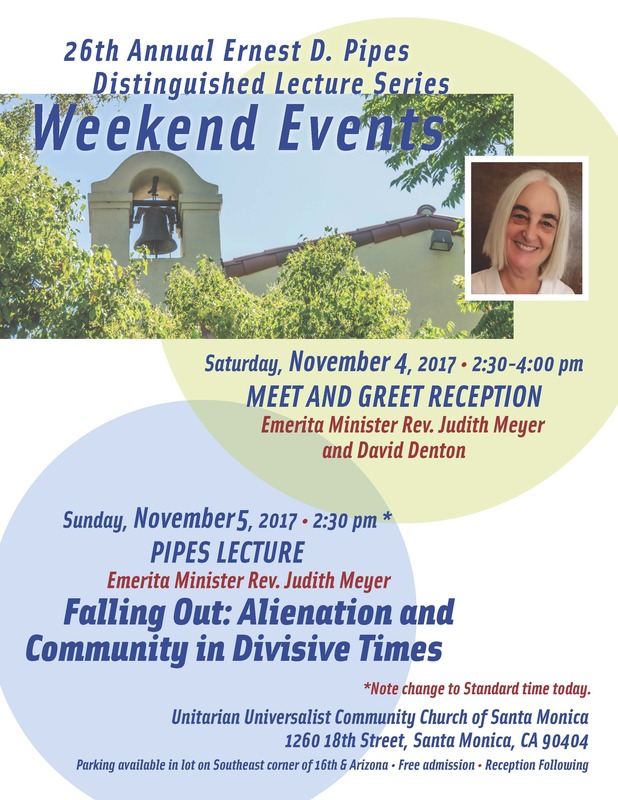 Meyer’s talk for the Pipes Lecture is “Falling Out: Alienation and Community in Divisive Times.” She will offer reflections on life in a red state, especially during this perilous year, and suggest ways to cope with the widening and hostile differences in our country. Many of you will warmly remember Rev. Judith from her ministry here from 1993 to 2008. She and her husband, David Denton, will be returning to visit Santa Monica from their home in Knoxville, TN. Our minister emeritus, the Rev. Ernie Pipes, for whom the lecture series is endowed, is pleased to have Rev. Judith join us as speaker. For those of you who don’t know Rev. Judith Meyer, we expect you will share our enthusiasm when you meet and hear her. UPDATE: The full text of Rev. Judith Meyer's address is available here. The audio recording is available here. Annual Ernie Pipes Lecture reception: Sat, Nov 4, Reception begins at 2:30pm and goes until 4pm. Forbes/Courtyard. Please join us on Saturday for a Meet and Greet Reception with our Minister Emerita, Rev. Judith Meyer and special guest David Denton. The formal talk is Sunday, we look forward to seeing you at this more informal event! Parking is provided at the UCLA structure. Contact: Diana Spears, dianaspears3@gmail.com. Note: The full text of Rev. Shulz's address is available here. The audio recording is available here. This 25th anniversary year, the Pipes Lecturer will be the Rev. Dr. William F. “Bill” Schulz, who delivered the first Pipes lecture. Rev. Schulz, a longtime friend of Ernie, has served as president of the Unitarian Universalist Association, executive director of Amnesty International USA, and, until July of this year, as president and CEO of the Unitarian Universalist Service Committee. Please note that this lecture follows the Sunday services, which this week will be a celebration of Rev. Pipes' 90th birthday. Please join in the weekend celebration of Ernie and in remembering his wife and partner in ministry, Maggie Pipes, who died in 2012. If you have any questions or thoughts about the celebration, please contact Patrick Maguire. More details in the October newsletter. Climate Change! Global Warming! CO2 Emissions! What is the human relationship to this phenomenon? How close is the tipping point? What can we do ? How urgent is it? Nothing affects us more as individuals or as a planet than the weather. On Saturday, October 10th at 7:30 pm, the Pipes Lecture will present James Dusenberry from AL Gore's Climate Reality Project to answer some of these critical questions. Don't miss this opportunity to refresh your understanding of climate change and it's potential as a life altering phenomenon. We also may have some manner of participation by Mike Farrell on his presentation of Doctor Keeling 's Curve, whose observation first convinced many of climate change decades ago. Where the lives of children hang in the balance, Los Angeles Times columnist Sandy Banks continues to shine a light on the big-picture forces that break families apart and the individuals and organizations that help children thrive. The Unitarian Universalist Community Church of Santa Monica (UU Santa Monica) is proud to help propel this dialogue on foster care, presenting the 2014 Ernest D. Pipes, Jr. Distinguished Lecture by Ms. Banks. “Foster Care: Behind the Headlines, The Pain and Promise of Broken Families – How We can Help Them Heal” will explore both the socioeconomic pressures that lead families to tragic separations, and the community-based solutions that can turn the failing system around. The presentation is FREE and open to the public on Saturday, October 25 at 7:30 p.m. The lecture includes a brief question and answer session, followed by a speaker’s reception with light refreshments. 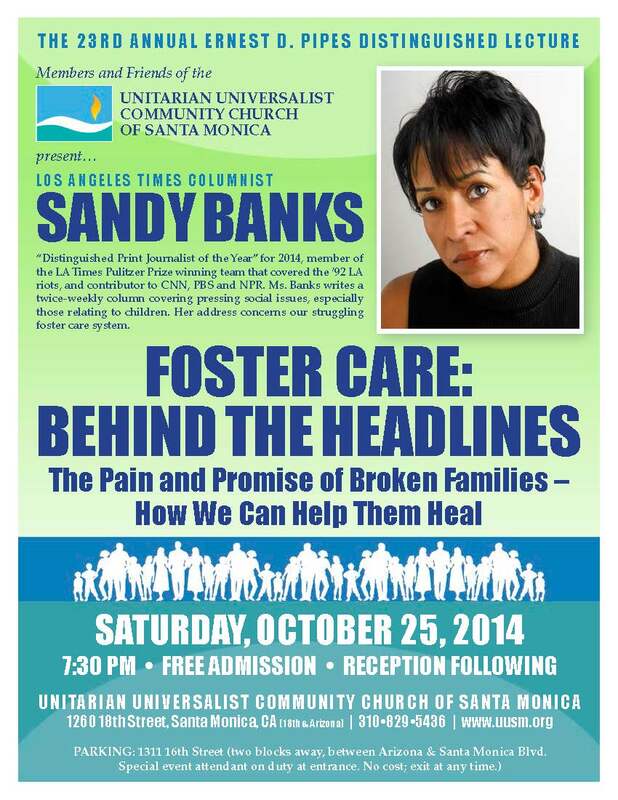 Location: Unitarian Universalist Community Church of Santa Monica, 1260 18th Street, Santa Monica, CA 90404 (map). Free parking will be available in the parking structure on 16th Street just south of Arizona Avenue. Handicap parking is available behind the UU Santa Monica campus. Los Angeles Times columnist Sandy Banks explores the human issues that shape our collective consciousness. Throughout her impressive 35-year journalism career, her coverage of education, religion, criminal justice and race relations has been honored by the National Council of Jewish Women, the Muslim Women’s League and the California Teachers’ Association. She was on the Pulitzer Prize-winning team reporting on the 1992 Los Angeles riots, and in 2014 the Los Angeles Society of Professional Journalists named her its Distinguished Print Journalist of the Year. A native of Cleveland, Ms. Banks moved to Los Angeles with her husband in 1979. She was widowed in 1993, and raised three daughters (now 29, 25 and 23) as a single mother in Northridge. The Ernest D. Pipes, Jr. 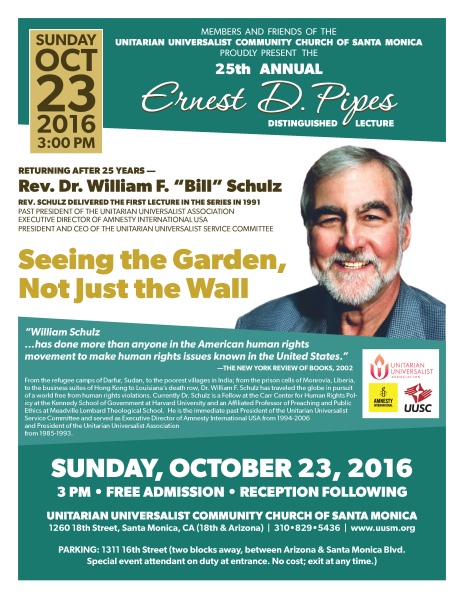 Distinguished Lecture Series was founded by UU Santa Monica members who wanted to honor the service of the Rev. Ernest D. "Ernie" Pipes, Jr. when he retired after 35 years. The Annual Pipes Lectures invite the larger community into conversations about issues related to Rev. Pipes’ vast exploration of social, civil, philosophical, religious and worldly concerns. Over the years, 22 distinguished speakers have covered a variety of topics, including corporate greed, civil liberties, health care and boundless compassion. The lecture series endowment remains vital, as does the Rev. Pipes, now Reverend Emeritus at UU Santa Monica. He will be attending the 23rd lecture this month. 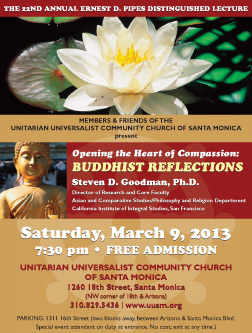 About UU Santa Monica The Unitarian Universalist Community Church of Santa Monica was founded in 1927 and is affiliated with the national Unitarian Universalist Association. The UU Santa Monica community embraces many beliefs and many backgrounds. UUs celebrate unity in diversity, affirming the supreme worth of all persons, held together through love and a spark of divinity that resides in us all. The community is also a Welcoming Congregation, welcoming all persons and families regardless of sexual orientation. With one of the largest UU Religious Education programs in Southern California, UU Santa Monica supports both youth and adults in their search for understanding, insight and inspiration. The church is an active center for social justice, peace and sustainability. For a full calendar of events visit www.uusm.org or connect with the community on Facebook @UUSantaMonica. PARKING: 1311 16th Street (two blocks away, between Arizona & Santa Monica Blvd.